Spring cleaning just isn’t what it used to be. A more accurate term might be “spring clearing,” since uncluttering is often what needs to be done before cleaning. But whether you live in a tiny condo or a spacious house, clearing out clutter isn’t just a springtime ritual. A clutter-free home requires an ongoing commitment to staying streamlined. Here are 10 key ways you can get — and keep — your household organized and uncluttered. 1. Take time to make time. Daily, make it a part of your routine to schedule brief blocks of time for processing household paperwork (including bill-paying, correspondence and filing) and putting things in order. Weekly (or more often), sit down with your calendar or time management system and your “to do” lists and allocate time for the home projects you want to accomplish over the next week. 2. Set up a work space. Choose an area that’s comfortable for working on ongoing projects and paperwork maintenance. If your space is very limited, you can create a portable home office setup with a lap desk and a Rubbermaid file box. They can be used in conjunction with the kitchen or dining-room table, which in many homes are the most popular places to do paperwork. 3. Make it easy. Put frequently used items in convenient places. Instead of storing supplies only where they fit best, locate them close to where they are used most often. Get rid of things that don’t work well and replace them with products that are easy to maintain and a pleasure to use. Set up a simple paper-flow system to give you an easy place for temporary storage of active papers. To help discourage messes, make it easy to discard things quickly. Keep at least one wastebasket handy in every room. 4. Practice making decisions. Exercise your decision-making muscles as often as possible instead of putting off making a decision “til later.” Here are two examples: When you remove an article of clothing, decide to put it where it belongs instead of leaving it somewhere else. Whenever you pick up a piece of paper, decide how you’re going to deal with it while it’s in your hand instead of putting it in a pile. 5. Establish an “In-Out Inventory Rule.” For each item that comes into your home (such as books, videos, CDs/DVDs, clothing), another item of equal type should go out (to charity or resale). If you can get in the habit of following this maintenance rule for even one of your “clutter categories,” your stuff will be less likely to reach the stage of critical mass (or critical mess, as the case may be). 6. Let go of clutter daily. 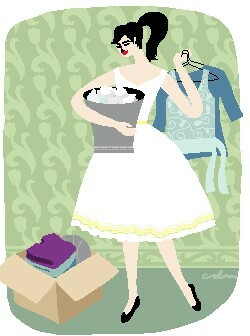 Each day, make a conscious effort to let go of at least one unit of clutter. The “unit” can be one item or one container-full. As long as you do it consistently, you’ll see results. Remind yourself that the more stuff you choose to let go of, the less time you’ll need to spend maintaining it. 7. Fuel motivation with visible results. Motivate yourself to get rid of clutter by creating noticeable results quickly: Begin by decluttering the easiest and most visible cluttered area or segment. Seeing a positive change is energizing and can make you want to keep going. 8. Keep the best, let go of the rest. Clothing and accessories become easier to part with when you apply this rule: Only keep items that make you look good AND feel good. So if it looks good but makes you feel uncomfortable, get rid of it; if it’s comfortable but makes you look bad, let it go. 9. Keep the positive, let go of the negative. If your clutter includes sentimental objects, here’s a rule to remember: Let go of anything that doesn’t touch you in a positive or poignant way. Don’t keep anything that makes you feel stressed or upset (unless you’re legally required to keep it).